Not long ago a good friend of mine posted on Facebook a newspaper announcement that: "The board of the Delaware Symphony has decided to cancel the next season of the orchestra." As usual the reason was linked to the financial situation. The "shock waves" were felt as far as two hours away, which is where I live in Maryland. I immediately wrote to my friend offering to come and play a benefit concert. My main goal (aside from a chance to have lunch with my good friend), was to show that people outside the community also care. I also wanted to raise awareness to my strong belief that canceling a season / cutting concerts… could not be a solution for "helping" sustain art. In other words canceling music could not help make music. 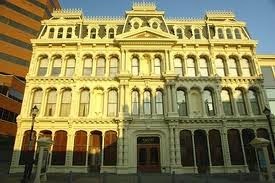 There has to be another way, or music will not be heard anymore in this beautiful building shown here. Before playing a note, I addressed the appreciative audience, many of which were patrons, sharing with them my feelings and concerns regarding cutting concerts due to financial climate. The second step after that is probably shutting down the museum because that takes a lot of tax money. Next on the list will be turning the park into a parking lot, and soon enough, without music, museum and a park we might as well move to another city, one that offers these essential "luxuries". The recital raised $50,000. I was happy and proud, but later learned that this is like giving a band-aid to stop massive bleeding. On the contrary, last weekend I gave a concert in a small town in Virginia called Staunton. Nestled in the Shenandoah valley near the foothills of the Blue-ridge mountains, prior to the year 2000 Staunton was just another little town, an exit on interstate 81 going north or south. 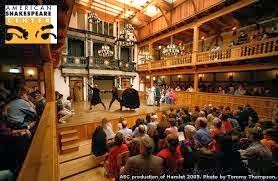 In 2001 a group of art lovers got together and raised money to build the only re-creation of a Shakespeare indoor theatre in the US - The Blackfriars Play House. The city was transformed after the theatre was built, and the American Shakespeare Center, which was founded in 1988 as a Touring Troupe, moved in as its resident company. Since opening its gates more than half a million people visited this theatre. A number of hotels opened up in the downtown area along with new restaurants. The town is now a cultural destination where people from all around come to see one of sixteen different productions each year. The shows run five days a week, a total of 7 performances mostly in the evenings but also at times in the morning (for students) and afternoon (the elderly). 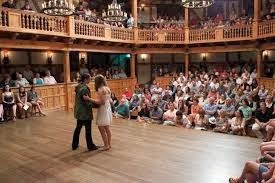 I could not help it, and went to see Shakespeare's "As you like it" at 10:30am the morning of my concert. There were many students. It was thrilling - so fresh, so alive. I was inspired. In the middle of nowhere, three hours away from the nearest big city, there lies a small town that thanks to its theatre has become a destination to many. I want to believe it has also become a better place to live. Seven performances a week?! Are there so many art lovers in Staunton to fill the sits? Maybe the answer is that when you build something special people will come? Perhaps also the people who helped create this place feel responsible to bring their friends to the shows? Whatever the answer may be, it is an example of how to create not to cancel, how to make something where there was nothing, and how art can change as well as revive a whole town.